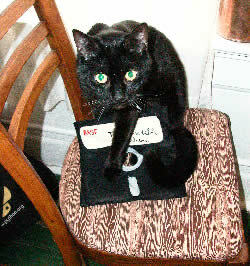 floppy disk potholder by tamas, sarah & bagheera. thanks yall! In computing, a core dump consists of the recorded state of the working memory of a computer program at a specific time, generally when the program has terminated abnormally (crashed). In practice, other key pieces of program state are usually dumped at the same time, including the processor registers, which may include the program counter and stack pointer, memory management information, and other processor and operating system flags and information. The name comes from the once-standard core memory technology. Core dumps are often used to diagnose or debug errors in computer programs. On many operating systems, a fatal error in a program automatically triggers a core dump, and by extension the phrase "to dump core" has come to mean, in many cases, any fatal error, regardless of whether a record of the program memory results. The term "core dump" has become jargon to indicate any circumstance where large amounts of unedited data is deposited for further examination. Cryptomnesia, or inadvertent plagiarism, is a memory bias whereby a person falsely recalls generating a thought, an idea, a song, or a joke, when the thought was actually generated by someone else. In these cases, the person is not deliberately engaging in plagiarism, but is rather experiencing a memory as if it were a new inspiration. Free association (Psychodynamic theory) is a technique used in psychoanalysis, first developed by Sigmund Freud. In free association, psychoanalytic patients are invited to relate whatever comes into their minds during the analytic session, and not to censor their thoughts. This technique is intended to help the patient learn more about what he or she thinks and feels in an atmosphere of non-judgmental curiosity and acceptance. Psychoanalysis assumes that people are often conflicted between their need to learn about themselves, and their (conscious or unconscious) fears of and defenses against change and self-exposure. The method of free association has no linear or preplanned agenda, but works by intuitive leaps and linkages which may lead to new personal insights and meanings. When used in this spirit, free association is a technique in which neither therapist nor patient knows in advance exactly where the conversation will lead, but it tends to lead to material that matters very much to the patient. Its goal is not to unearth specific answers or memories, but to instigate a journey of co-discovery which can enhance the patient's integration of thought, feeling, agency, and selfhood.